BDO has published an interesting report into the current use of social media within local government in the UK. BDO worked with Municipal Journal (MJ) to conduct a survey to find out how 67 local authorities are currently using social media to support a range of services. 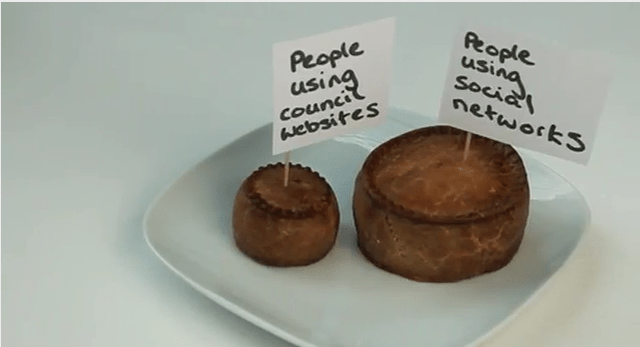 I particularly like the pie chart to illustrate that people spend more time on social media and social networking sites than they do on council websites. Quelle surpise. Although I think they should have has a big pie for social sites! 24% of councils have reduced face to face visitors by using social media – In the current financial climate this is good because face to face contact is the most expensive form of customer contact for a local authority – £7.40 for face to face, £2.90 telephone and 32p for online. 60% of councils block social media on internal PCs â€“ Local authorities are frequently conservative (with a small c) and change is difficult, but if the right social media policy is in place then councils can make massive gains by removing this absolute ban (controls are guidance are still fine and can actually be empowering. 82% think council staff are confused about how to use social media â€“ That’s because they are! And its not just how to use social media professionally. Although most people use social media personally many don’t know how to use it well or safely. That’s another reason why councils need social media policies and training in place. Even if they aren’t proactively using it to improve services and reduce costs they need that policy as an ‘insurance policy’ in case things go wrong because most of their staff and residents are already using it. 79% of local authorities said that the comms team was ‘currently responsible for social media’ with only 15% saying it is dispersed, 3% customer services and 3% services â€“ This is potentially quite alarming as it implies that most local authorities still haven’t grasped the broader strategic implications of what the social web means to providing services to residents. Many of the case studies featured won’t be new to anyone whose familiar with how the public sector uses social media (many of the examples are actually from police, rather than local authorities) and there are some notable examples missing â€“ none of the award winning social media work from Monmouthshire. BDO is trying to get an online conversation going using the hashtag #litter2twitter. It has to be assumed that the objective of using social media for a body such as a council is to interact with residents of a particular area, to inform them of new schemes and developments of existing ones on subjects such as council tax, recycling and local events. Its aim is to reach as large a proportion of their population as possible, and therefore I assume most councils would use several sources to achieve this, including direct mail, email, drop-in centres, advertising, press releases and social media. Judging by the three latest tweets on my local council’s (Manchester) Twitter feed – a new crime strategy in a specific area, latest plans for Manchester Day, and a Duck Race event – the objective is well met. Twitter, and other social media, would seem to be a useful outlet for two-way communication with residents. This, however, does not seem to take into account the specific demographics of the residents the council are trying to associate with. According to the council website, there are 498,000 people in their area. The Twitter feed is followed by 9,616 people – or 1.93%. If you add into the mix non-quantifiable statistics, such as the likelihood that most people who are interested in council services could well be of an older age and less likely to be using Twitter, it puts into question the benefits of having such a feed. Considering the adverse coverage the council received when it advertised for its Â£38,000 Twitter and Facebook supremo (http://tinyurl.com/ceh9nn8), would more people perhaps be more supportive if the money spent to maintain and update social media was spent on improving local services? Many organisations have a desire to be on Facebook and Twitter simply because it is seen as the way forward. but, as in all areas of PR, unless the message is strong enough and reaching the right groups of people, it is a poor use of resources. The usage of social media in government is definitely not at the same level as the private sector. As someone with experience with working for the government (at the state level), my department has very difficult time with using social media. The department wants to use it to get information out to the public but has very limited capabilities and usage. It is extremely restrictive at times, and we do not have access to social media on our internal computers and devices. Any social media messages must go through the public affairs division which could take a very long time to get any sort of information out and sometimes very difficult to have any sort of timely response to public inquiry. It can be frustrating at times, particularly since social media is an easy, fast way to reach people. By having such limited social media our department often suffers from a disconnect with the public and people are often frustrated that it is so difficult to get in touch with our department or to get information at times.